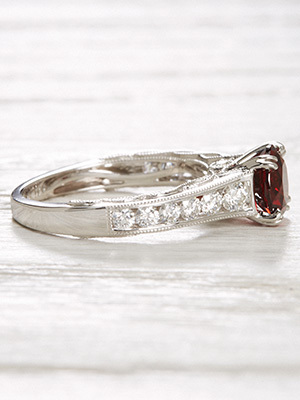 Diamond accents cool the fiery blaze of this vintage style engagement ring's almandine garnet. 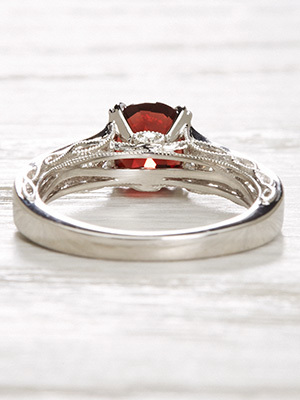 The white gold setting and icy streams of diamonds that cascade down the shoulders contrast the garnet's spirit of fire and passion. Delicate mill grain fringes the diamonds. 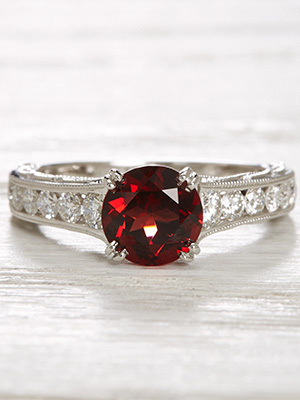 The hot and chill combination of the stones sets this engagement ring a-sizzle. Details: Vintage Style. New. 18k white gold. Round brilliant cut diamonds; 0.56 carats. 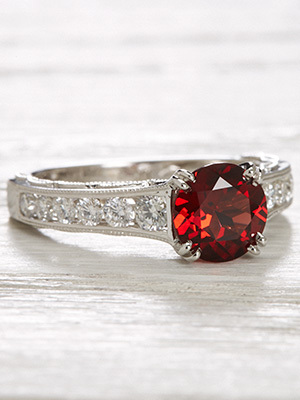 Almandine garnet; 1.55 carats. Special characteristics The mounting features a double 4 prong setting.